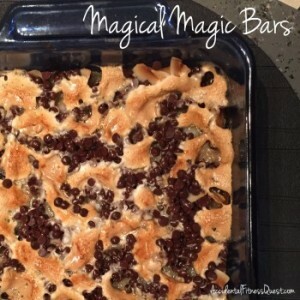 You magically get some great cookie bars. Sigh. Sadly there isn’t a dairy free version of sweetened condensed milk that I’ve found. I supposed you could try with soy or almond milk, but I’m not envisioning that turning out like the thick sweet goodness of the canned dairy version. However, don’t forget about the wonders of tofu. 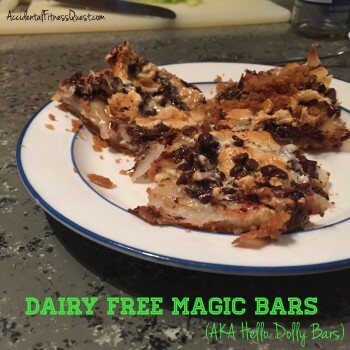 If you can use tofu instead of ricotta cheese, dairy free alfredo sauce, and in things like chocolate mousse, then why on earth couldn’t you use it in magic bars? Spoiler alert: Ohhhhh yeah, baby. You can! e your graham cracker crumbs, toss the whole crackers into your food processor or Magic Bullet to whir them up now. Mix the crumbs with the butter and microwave for about 30 seconds until the butter melts. Stir the crumbs and butter together, and press into the bottom of the prepared pan to make the crust. Combine the tofu, milk, sugar, and cornstarch and blend in your Magic Bullet until smooth. Pour the tofu mixture over the graham crust and spread evenly. Sprinkle the coconut and chips on top and press lightly to smooth. Sprinkle on the marshmallows. Bake at 350 degrees for 30 minutes. Remove from oven and cool before cutting into 9 bars. Makes 9 servings at approximately 245 calories each – 4g protein, 28g carbs, and 13g fat. Because this is a baking recipe, I’m going to give you the details of what I used since it could impact your results. Baked goods are a bit less forgiving on ingredients and amounts than regular recipes. Sheesh, high maintenance baked goods. If you are attempting to make this recipe pure vegan, read the box of graham crackers because most are not vegan. They are typically dairy free though so that was good enough for our purposes. Smart Balance and Earth Balance both make dairy free butter so that’s what we used. I used Let’s Do Organic Unsweetened Coconut Flakes and chose the large flakes instead of the finely shredded. Unsweetened coconut tends to only come in very tiny shreds or the big flakes, not like sweetened coconut flake size which is kinda in between. I thought the big flakes would work better to hold the bars together. We used Enjoy Life Dairy Free Mini Chocolate Chips. They also have chunks and regular sized chips so you could sub those in if you prefer a different sized chip. Dandies and Trader Joe’s both make vegan marshmallows. Dandies are harder to find and more expensive so if you can get to a Trader Joe’s do it. Obviously if you aren’t vegan, then you can use plain ole marshmallows. Traditional Magic Bars and Hello Dolly Bars use pecans in the recipe, but The Kid is a nut hater so I left those out. Instead of just making the bars with coconut and chocolate chips, I found an almost empty bag of marshmallows and tossed those in. I only had 12 regular sized marshmallows hence the odd amount, and I cut them into quarters to make them more mini marshmallow sized. If you have mini marshmallows, that will save you the cutting step. You could also use pecans in place of the marshmallows for a more authentic recipe. The bars turned out just as gooey as I remember the real thing being, and they didn’t make it until Thanksgiving dessert before we sampled a few. Sprouts has coconut milk condensed milk. But tofu is probably healthier!